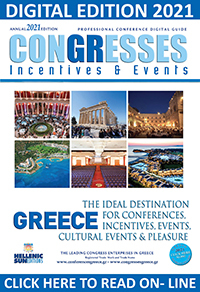 P.C.O's - Greek professional congress organizers with their long experience in the organization of major incentive congresses, events, major international sport and cultural events, daily prove that Athens, Thessaloniki, Crete, Rhodes, Kos and all over Greece could become an ideal congress destination. Greece, with its incomparable advantages, the vast experience of its P.C.O's and D.M.C's, is daily recognized as one of the most popular congress destinations, continuously gaining ground in the competitive international congress market. P.C.O's and D.M.C's in Greece offer high quality services, a multitude of activities and as a matter of fact that they have organized a numerous major international conferences drawing absolutely positive comments, placing Greece among the top conference destinations. P.C.O's and D.M.C's in Greece play a decisive role in the organization of a conference from start to finish. With their experience and cooperation with all involved agencies, they guarantee and greatly contribute towards the absolute success of your convention or event.